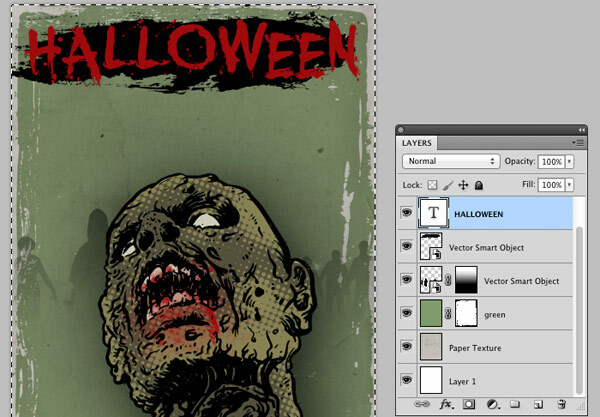 We’ll be looking at how to create an old worn looking horror movie poster. 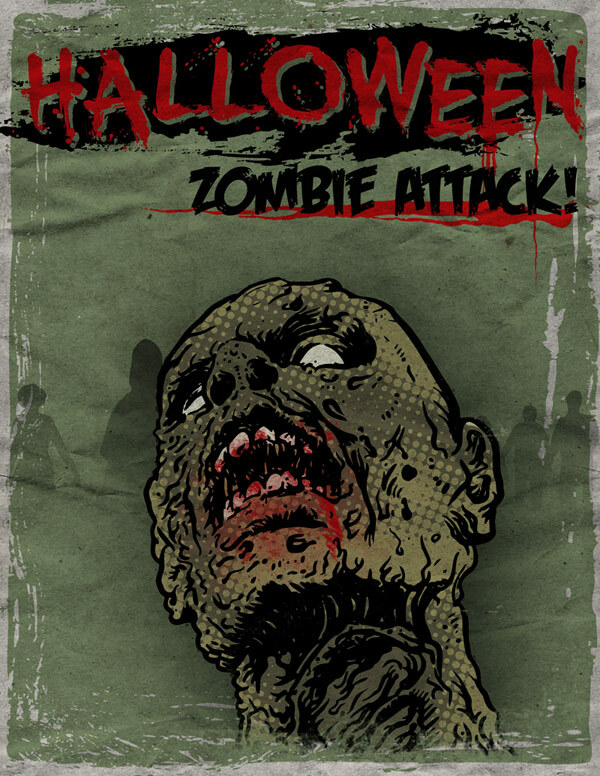 This tutorial uses both the “zombies” vector set, as well as the “blood drips” vector set, both taken from this week’s huge vector deal. 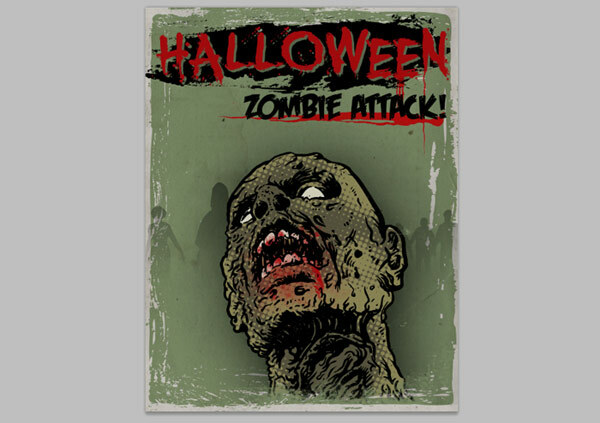 We’ll be combining these vectors with some old rough paper textures and Halloween style typography to create a frightening movie poster. NOTE: This tutorial was written by our community member Ben, from Ben Brush Design. The fact Ben offered to write this tutorial for you guys is incredible, and we highly recommend you checking out his site, where he offers awesome design tutorials and freebies. There’s some really great stuff over there. 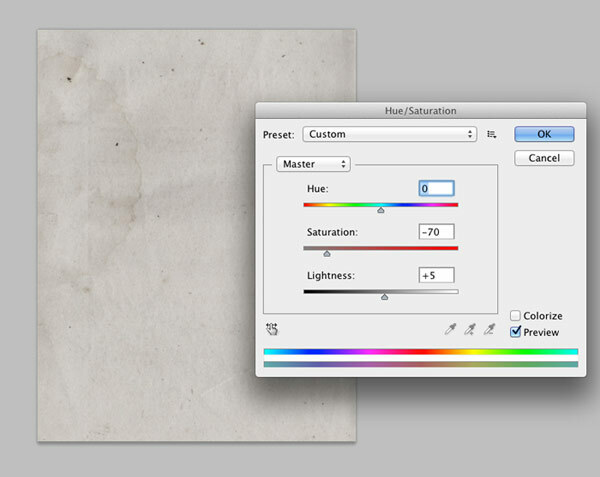 Open Photoshop and create a new 21.6 x 27.9cm document, at 300 DPI resolution. 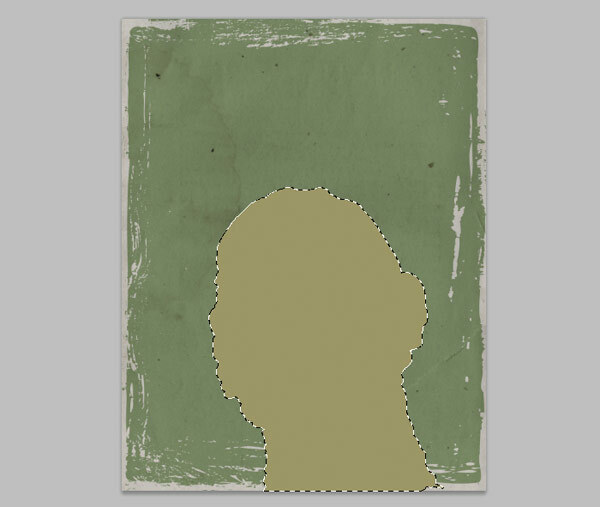 Download this Lost and Taken Paper Texture and place it in the document. 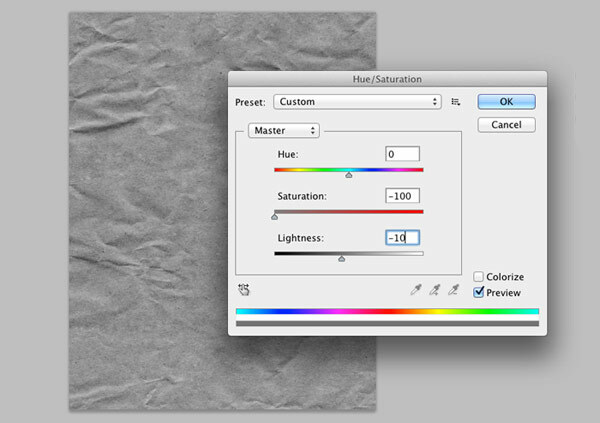 Adjust the Saturation to -70 and the Lightness to +5. 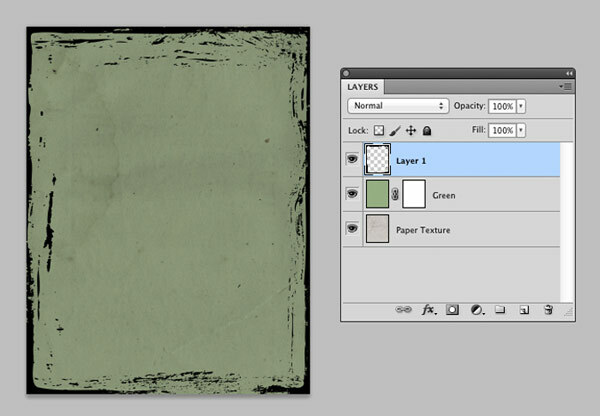 Download the “Grunge Frames Vectors” from the Design Cuts Freebies page and import one into your photoshop file. 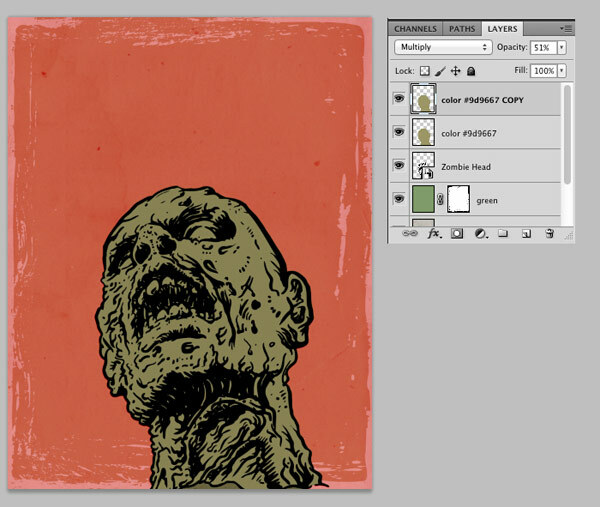 Select the entire layer using Select > All (Cmd+A) and copy the frame. 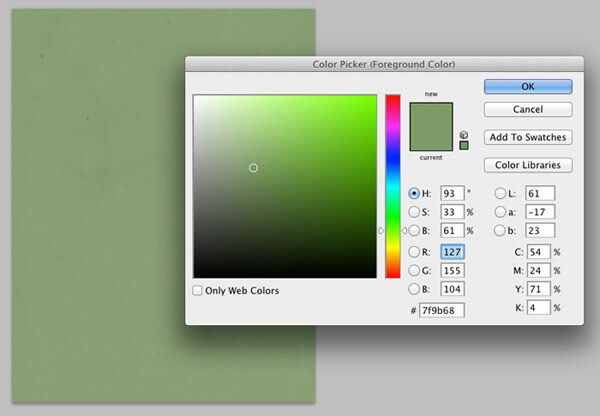 Create a layer mask for the layer “green” and paste the frame into it so it edges the entire poster. 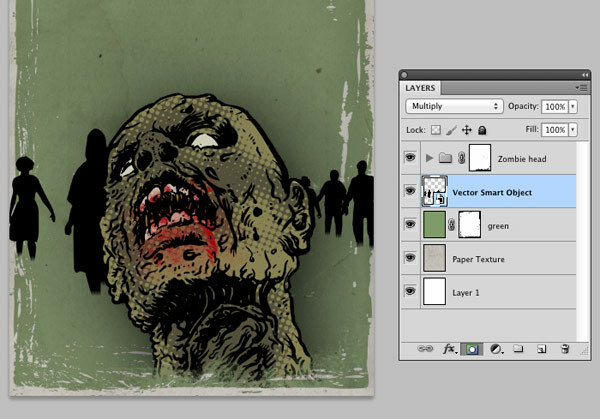 Now we’re going to dig into the ‘Zombies’ vector pack, available exclusively from Go Media. 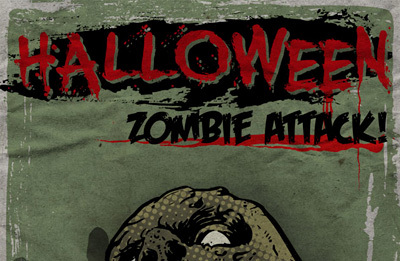 You can grab this pack, along with 1360 quality vectors as part of our current deal. For the next week only, these vectors are available for a HUGE 93% off. If you’ve grabbed these vectors already, you’re all set. If you haven’t yet, we can’t recommend them enough. 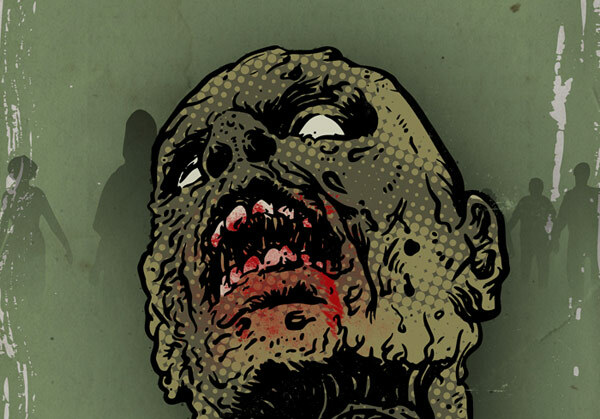 Align the bottom of the zombie’s neck with the bottom of the poster. 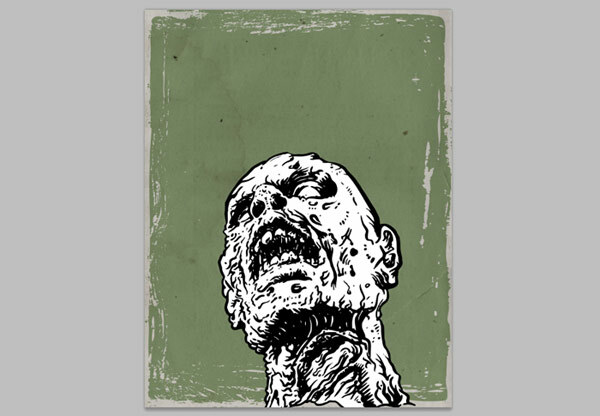 Option+click on the zombie head layer to select the zombie head. Once in Quick Mask Mode use a soft, round brush to paint in some shading on the face. The effect we are going to use will work best if there is lots of soft, semi transparent shading. Anything painted red in this step will remain light green and what isn’t painted we will darken later. Set the Max Radius to 30 and all of the screen angles to 22. 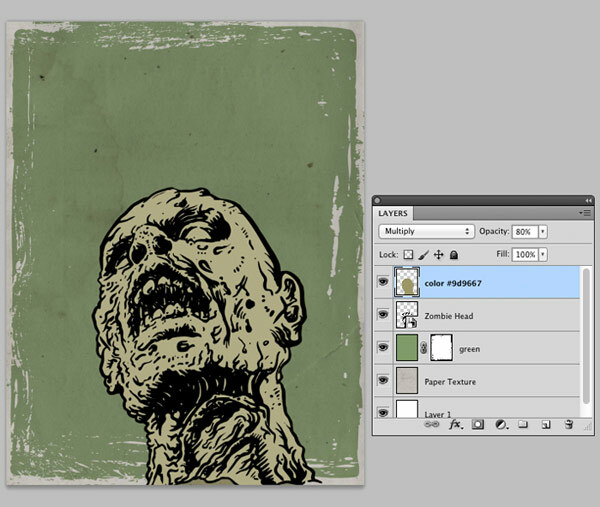 This will render the shading into a halftone pattern. 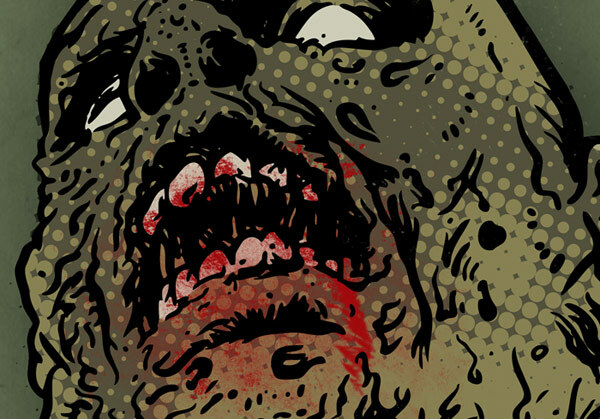 When you exit Quick Mask Mode you will have a selection of the halftone shading. 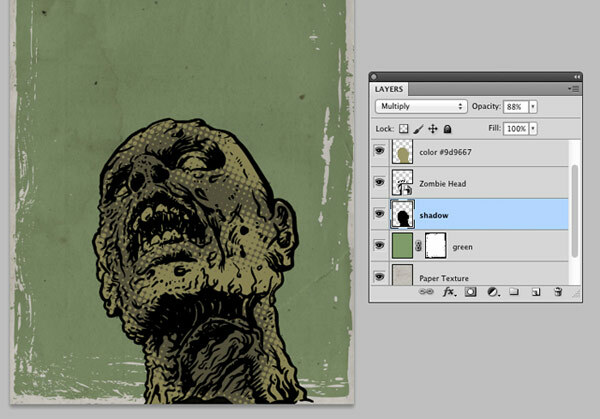 Create a new layer called “Shadow” and place it just below the “Zombie Head” layer. 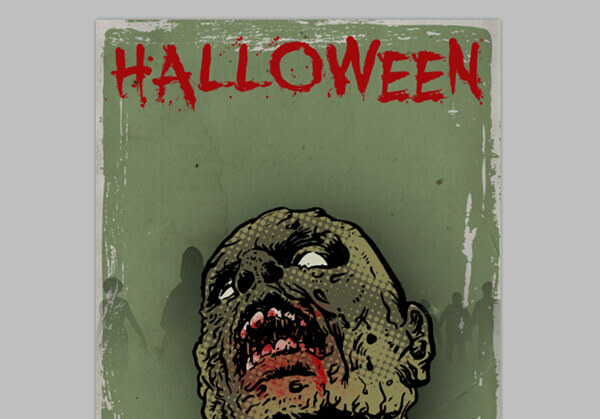 Select the zombie head shape again, and fill it with black. 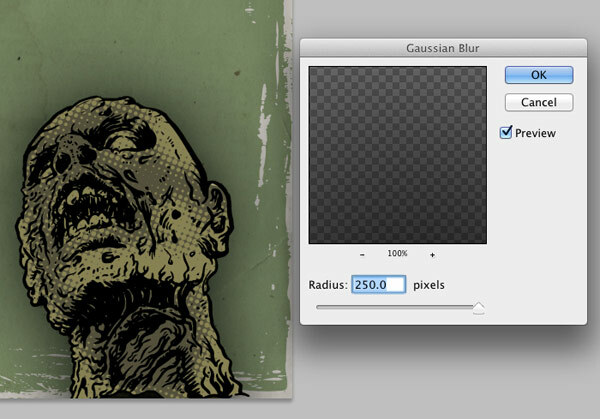 Apply a Gaussian Blur with a radius of 250 pixels to this layer to create a shadow behind the head. 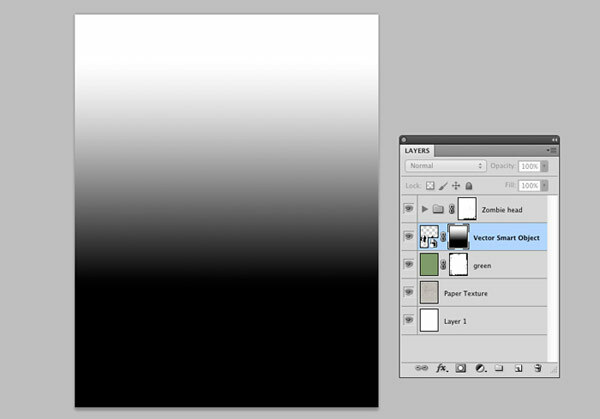 Change the Blend Mode to “darken” This will hide the white and make the outline nice and dark. Use a brush to paint the teeth and eyes white. 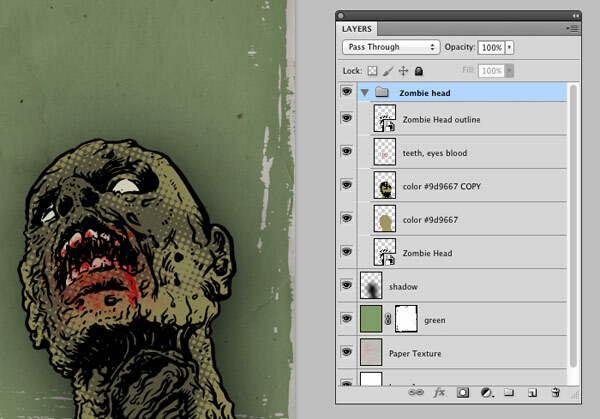 Make a layer group called “Zombie Head” and put all of the layers that make up the head into it. 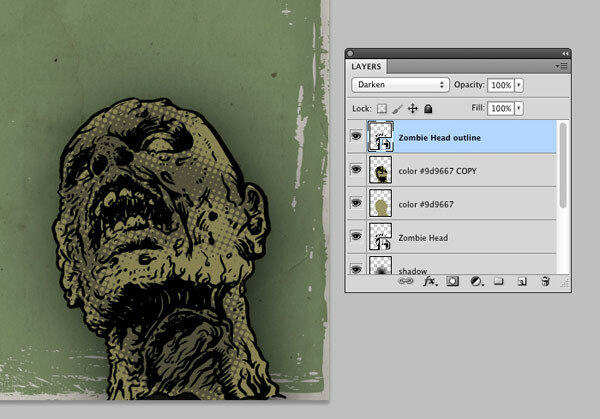 Add a layer mask to the group and use a rough black paintbrush to mask off the zombie neck. 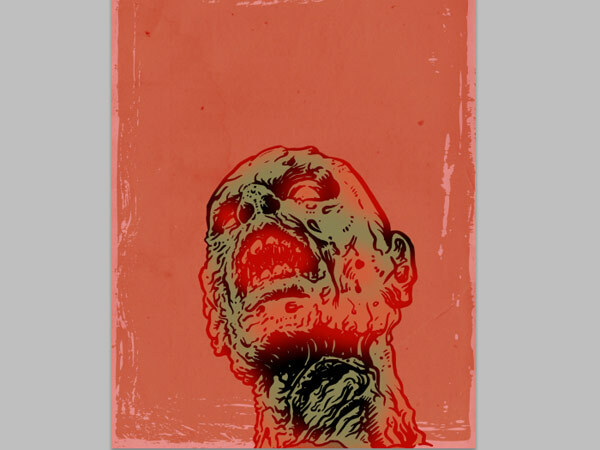 Add a layer mask and use the gradient tool to mask off the bottom of all the zombies, giving them a more ghost-like appearance. 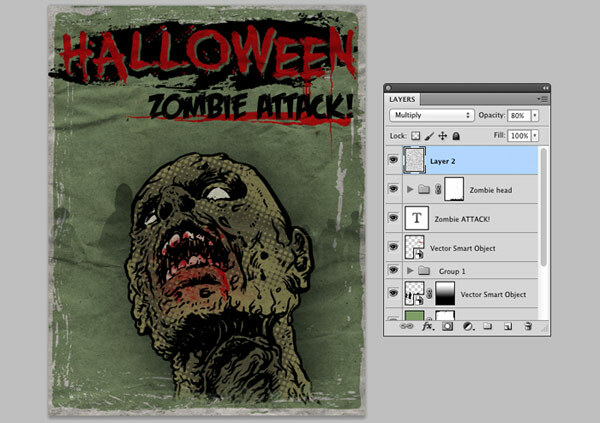 To create a little drop shadow effect create a layer mask on the black stroke layer. Copy the text you just typed out and paste it onto the layer mask slightly below and to the side of the original text. 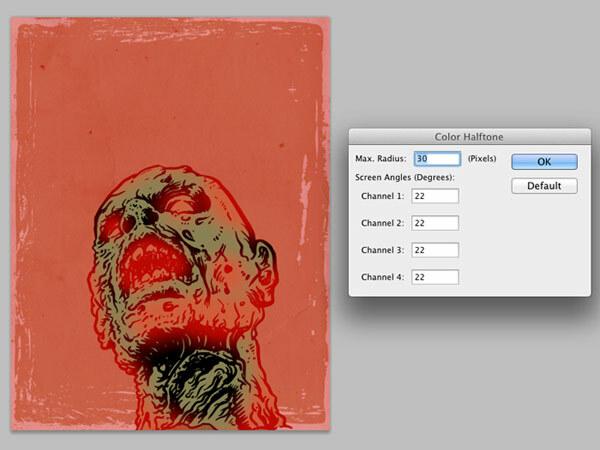 Set the vectors to red (#a00a0e) and import them into Photoshop. Place them just under the lettering. 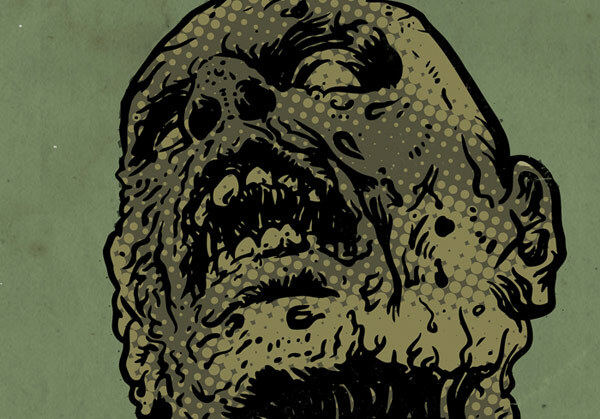 Grab the font Feast of Flesh and add some extra lettering to your design. I added another “Blood Drip” as an underline here. 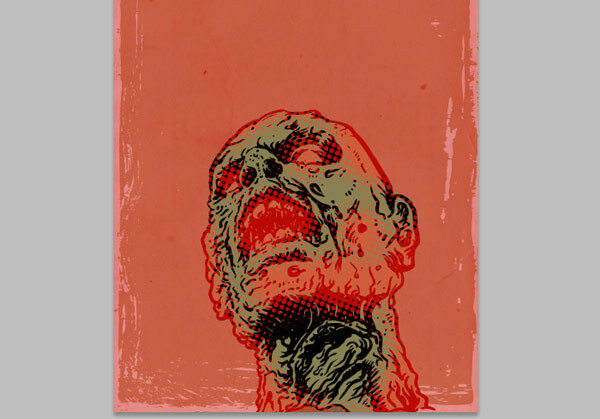 Next we want to add a final bit of aged paper texture to really make the poster look worn and grungy. 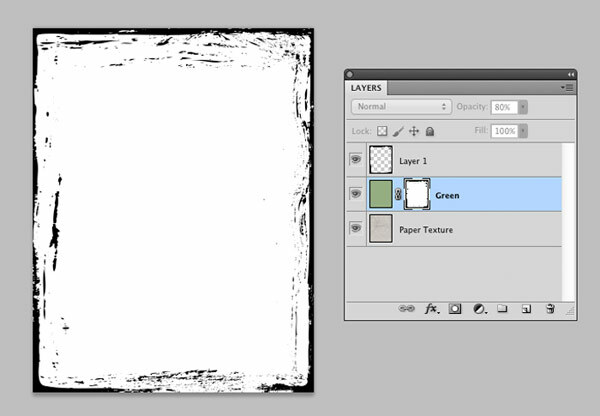 Download this Paper Overlay Texture and put it on a new layer on the very top. You can view your final outcome below. We hope that you enjoyed this tutorial and would love to hear your feedback on the techniques and outcome. If you haven’t checked it out yet, be sure to take a look at this week’s deal. The vector packs you’ve just worked with are just a TINY sample of the 1360 beautiful vectors available as part of Go Medias ultimate vector collection. You can preview all 49 vector packs via the link below, although the deal is ending soon, so you’ll need to act quickly to grab them at a 93% discount. That’s great news Dorothea and welcome to the Design Cuts community!